Those of us who have been working on the depot have long felt that the future of the depot ties in with the future of the railroad. That's why it came as good news that the Washington and Idaho Railroad has landed a new customer in addition to Bennett Lumber Products of Princeton. W&I President Stan Patterson tells us that Stella Jones Corp. will be trucking cedar poles to the Harvard siding for rail pickup. Stella Jones, a Canadian wood products company, recently bought out the Baxter Pole Company mill at Juliaetta, and plans to ship 10,000 to 12,000 poles from Juliaetta to Canada for further processing. Trucker Greg Stancil of St. Maries delivered the first load of 45-foot long poles to Harvard on Friday (see top photo), with rail pickup set for next week. He says the flatcar can haul 3-4 truckloads. As for Stan Patterson, he is very happy about the new customer, and said BN helped broker the deal, which allows Stella Jones to ship from Harvard rather than Lewiston. Just 10 miles south of Moscow, the historic Kambitsch Farm barn is being dismantled (see photo above), another casualty of progress. The barn is owned by the University of Idaho, and after a search for funding to rehabilitate the 80-year-old draft horse barn, the university had to give up. This is just a reminder that a similar fate awaited the historic WI&M depot at Potlatch, except that a few interested people put some effort into making things happen. We have more to do to finish the depot, but at least we don't have to watch it being dismantled. Comments are still coming in today about how wonderful the depot looked last night. Some visitors furnished details on original interior colors, expressing enthusiasm for getting rid of the "puke green" color that was likely painted throughout the downstairs in the '70s. Ruth O'Reilly reports that over 135 people signed the guest book (which was not brought out until the reception had been underway for an hour!). Pictured in this post are Orchid Award recipients. Don Somers holds his award, gaining recognition for all he has done to bring the project to fruition. The group photo shows: Morris Arnzen (contractor), Don Somers (President, HPG), Barb Coyner (Chairman, Latah County Historic Preservation Commission), Dan Karel (Porject Foreman) and Doug Wasankari (contractor for foundation, loading dock, parking lot and drainage work). Missing was Larry Duff who also received an Orchid Award for his generous roofing contribution. A Toast to the Depot! Ken Vogel, one of the depot backers, takes his turn talking to Santa (assisted by Elf Liann Kren), who made a special appearance at the Depot Open House yesterday. What do you think Ken asked Santa for? Ken and others gathered before the Annual Lighted Christmas Parade to celebrate completion of exterior restoration work on the depot. The Potlatch Historical Society provided refreshments, with Janice Palmer, Bonnie Rohn, Lindy Seip and Judi Rohn serving coffee, hot chocolate and cookies. Ruth O'Reilly presided over the guest book. 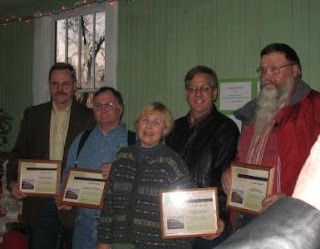 Orchid Awards were presented by the Latah Count Historic Preservation Commission Chairman Barbara Coyner, and the following were honored: Morris Arnzen, General Contractor; Dan Karel, Project Foreman; Doug Wasankari, contractor for foundation, loading dock and drainage work; Larry Duff, roofing contractor; Don Somers, HPG President. Among dignitaries on hand for the festivities were Jack Nelson and Jennifer Barrett of the Latah County Commission, Dorothy Anderson and Karen Owsley of the Latah County Historic Preservation Commission, Earl Bennett, District Two Representative for the Idaho State Historical Society, Janice McMillan, Latah Economic Development, Vern Johnson, Potlatch City Council, and Jim West, founder and past president of the WIM HPG. Watch for more photos of the open house in the next few days. And watch the progress continue on the depot! The depot is decorated, thanks to the Potlatch Historical Society and members Bonnie Rohn, Janice Palmer, Carol Haddock and Jack and Barb Coyner, who decked the halls, inside and out. We will try to post some photos in the next day or so. The interiors are still rough, but crews cleaned as much as possible, added lights and set up the requisite Charlie Brown tree, complete with vintage ornaments. Now we need some good weather for the big event Saturday. During the reception, the Latah County Historic Preservation Commission will present Orchid Awards. Stay tuned for the list of recipients. Thanks to Lewiston Morning Tribune reporter David Johnson for his nice article on the depot today. The prominent article also featureda photo of Don Somers and Jack Coyner sitting along the tracks looking like real hobos! POTLATCH - Not everyone was "all aboard" when a few people in this Latah County community proposed saving the town's century-old railroad depot. "Money down the drain," is how Don Somers describes the initial response from critics. But Somers and Jack Coyner, two self-described railroad buffs and principle ramrods behind the restoration, say almost everyone is now applauding the finished product. "There's been no negative. It's all positive," says Somers, president of the Washington, Idaho & Montana Railway History Preservation Group. "Half the town has come by to watch what's going on." And everyone, says Coyner, the newly elected president of the Potlatch Historical Society, is invited to an open house at the depot from 3-5 p.m. Saturday prior to the town's annual lighted Christmas parade. "I guess the way I've always looked at it," says Coyner, "is that between city hall, the old gymnasium and the depot, those are the three most important historic buildings in Potlatch." City hall has been restored and is being used. The gymnasium is in private ownership. And the two-story depot, built in 1906 with lumber from the original Potlatch white pine mill, has a new foundation, roof and paint job that makes it the third link to yesteryear. "All of the superstructure of that building is excellent," says Somers, "so we did not have major reconstruction, other than the foundation." The depot, considered the first commercial structure in what became known as a "company town," housed the original business offices on the second floor of what today is known as Potlatch Corp. For decades, freight and passenger trains stopped at the depot en route to and from Idaho's vast timberlands. "The main funding (for restoration) came from a $500,000 Idaho Transportation Department grant, funded through the federal highway program," Coyner says. "And in order to get that we had to match it with $57,000 worth of funds, or a combination of soft funds and volunteer labor." Matching fund contributions included $20,000 from the U.S. Department of Agriculture-Forest Service Rural Community Assistance, $10,000 from the Latah County commissioners, $8,900 from US Bank, $4,400 from the Idaho Heritage Trust, $4,000 from the Latah Community Foundation, and $1,000 each from the Potlatch Historical Society, and the Latah Historic Preservation Commission. And then, toward the end of restoration, Somers and Coyner say Larry Duff, a local logging contractor and civic-minded person with a love of history, made sure the aging depot roof sealed the entire structure to the elements. "They demolished the old roof and took it off," Somers says. "And he donated the shingles and the labor for the new roof. Actually, the bid for that work was around $60,000, so we have to assume that we saved by his donation at least that much money." Arnsen Building Construction of Cottonwood was the principle contractor on the job, with Wasankari Construction of Moscow being the main subcontractor. Wasankari, say Somers and Coyner, did most of the actual work and contributed at least $9,500 worth of donated demolition work. The depot, painted deep maroon and trimmed in green, matches its original appearance, says Somers, by both design and necessity. "Since it is an historical building, we have to preserve it up to a historical level." The project, which started in 2000 with the purchase of the depot, stalled when it appeared that the owner, short-line railroad company Watco, was going to require the structure to be moved 25 feet back from existing railroad tracks. After some lengthy negotiations, however, the preservation group received a quitclaim deed and the depot stayed at its original location. Shrouded for years with protective tarps, the building stood empty with a "Save Our Depot" sign attached to its side. But then restoration began earlier this year, with crews working through the summer and meeting a fall deadline for completion. Securing the Idaho Transportation Department grant, say Somers and Coyner, was key to the entire project. "They call it a transportation enhancement grant," explains Coyner, a retired Forest Service employee. "And they fund historical restoration if you can reasonably connect a building to a transportation system." Not only was the depot a key to early rail transportation, but it's located adjacent to Scenic Highway 6. "It fits right in," Coyner says. Now the focus turns to the depot's interior. People attending Saturday's open house will be able to enter the building and literally step back in history. But they will also enter a building that, according to Somers and Coyner, remains an unfinished dream. More money will be needed to not only remodel the interior walls, but upgrade the building's electrical and plumbing systems to modern standards. "There is no usable infrastructure in the building right now," Somers says. There are plans to someday incorporate a museum in part of the depot. People also talk of the potential for office space, or perhaps some retail businesses. "We've got to just keep looking for money to get the job done," Somers says. In the meantime, he and Coyner say they can rest assured that the depot is protected from the weather and capable of standing for at least another 100 years. Johnson may be contacted at deveryone@potlatch.com or (208) 883-0564.